The Alloggi Marinella, a.k.a. the Locanda Marinella, is a lovely small hotel on a quiet neighborhood street near the Piazzale Roma, which is served by airport buses, taxis, and the People Mover to the Marittima cruise piers and the Tronchetto parking garage. Normally we rent an apartment when we're in Venice, but during one stay, we needed a hotel for two nights before an MSC Eastern Mediterranean cruise. We wanted to be within a stone's throw of the Piazzale Roma, where airport buses and taxis arrive from Venice Marco Polo Airport, and where shuttle buses and the People Mover offer quick access to the Marittima cruise basin. 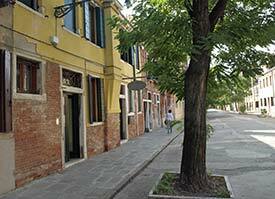 After weighing our options (see our Venice Cruise Terminal Hotels article), we settled on the Alloggi Marinella, also known as the Locanda Marinella. The first-class inn (roughly equivalent to a three-star hotel) is just across a bridge and a few meters down a quiet side street from the Piazzale Roma, and we were able to reserve a double superior room with a private patio at a discount rate through our booking partner. ABOVE: The Alloggi Marinella (a.k.a. the Locanda Marinella) is on the Rio Terà dei Pensieri, a quiet neighborhood street near the Piazzale Roma. Our two-night stay at the Marinella was extremely pleasant. On the next two pages, we'll show you captioned photos of the Alloggi Marinella and its surroundings, and we'll give step-by-step directions for reaching the Marinella from the Piazzale Roma, the railroad station, and the cruise terminal. The Alloggi Marinella is small, so book early if you want a specific type of room. The reception staff normally go home in the late afternoon, so let the hotel know if you'll be arriving after 4 p.m. If you can't get a room at the Alloggi Marinella, see our descriptions of hotels near the Piazzale Roma and hotels near the San Basilio cruise terminal. To book a room at the Marinella, check for the "lowest guaranteed rates" at Booking.com's Alloggi Marinella site or visit the hotel's Web site.